Roedd yr erthygl hon wedi trawsgrifio oddi wrth y Welsh Gazette, Dydd Iau 28 Gorffennaf, 1932 o microfiche yn y Llyfrgell Genedlaethol Cymru. “Parc Goffa” the memorial of the people of Llandyssul to those of its sons who fell in the Great War, was formally opened by Col. Fitzwilliams on Friday afternoon. This delightful spot, known formerly as “Cae Maesllan” is about four acres in extent. Bordered on one side by the old oaks of Dol’llan and the river Teify, and on the other by rising grounds, from which a good view of the town is obtained, it forms a pleasant and restful retreat. In the centre is a shelter, with a granite memorial tablet. The site was purchased from the Cilgwyn estate for £500, and improvements which have been carried out have cost about £400. The control of the park is vested in a body of trustees made up of Messrs. T. Thomas, solicitor (chairman); T. Davies, chemist; J. Isaac Thomas, Rev. D. Rhydderch, D. Meirion Davies, J. Esau, D.B. Jones, T. Davies, Elphin; James Jones, Maesycoed; and D. Lewis, Gomerial Press, with E.J. Jones, Glenville and J.J. Jones as secretaries. The opening ceremony was made the occasion for a general holiday, and the streets were gay with bunting. Fortunately, the weather, which was threatening in the morning, turned fine. The proceedings commenced with a carnival procession through the streets, headed by ex-service men in charge of Capt. W. Davies, M.R.C.V.S., girl guides, and school-children. This part of the programme created much interest and amusements, and the costumes and dresses of the children were much admired. Following the procession came speech-making at the park, where a large gathering was presided over by Mr. T. Thomas, solicitor, whose name has been honourably associated with every good cause at Llandyssul for many years. He was supported by Col. Fitzwilliams, Cilgwyn; General and Mrs. Vaughan, Brynteify; Commander and Mrs. B.E. Vaughan, Sussex; Major and Mrs. Burgoyne, London; Major H.G. Hawker, Plymouth; and the trustees. The proceedings opened with a short religious service conducted by the Revs. D.A. Thomas, M.A. (vicar), R. Morris, Penybont; D. Rhydderch (Sion); D.H. Mason, and E. M. Evans, Tabernacle. The hymns “O God our help in ages past” and “O Fryniau Caersalem” were rung, as well as the national anthems. The Chairman, in the course of his address, said they would regard the event as a red-letter day in the history of the town. Most villages had their village greens, but at Llandyssul they had never had a recreation ground. Through the kindness of Col. Fitzwilliams, they had now been able to secure a piece of land which in the course of time they hoped to make into one of the finest parks in the country, and a place where both children and adults could enjoy the hours devoted to recreation. The members of the committee felt they had not done a fourth of what they would have liked to do, but they were hampered by lack of funds. They had, however, made a start, and it was for future generations to improve on what had been begun. They had laid the foundation for a beautiful park – a place where children would be safe from the dangers of the streets, and where they could play to their hearts content; a place where young men and women could play tennis and other games; where the studious could pursue their studies in peace and quiet, and where the old and infirm could rest and meditate. The Colonel, in declaring the park open congratulated the committee on its idea of a war memorial. He went on to say that he could not let the occasion pass without referring to the loss sustained by the death of the Rev. T. Arthur Thomas, who prominently identified himself with the movement from the start, and who, had he been spared to be with them that day, would have been able to tell them a great deal of its history. That the park would serve to remind the young men and women of a great event in the history of the world. He trusted that the dedication of the park would make everybody realise what it stood for. It should make people who used the ground pause sometimes and realise that they stood on ground dedicated to dead comrades. He hoped that people who had little differences sometimes would come to that hut and look at the tablet. Such a visit should end all their little bickerings. In proposing a cordial vote of thanks to Col. Fitzwilliams, Mr. James Jones, solicitor, said that were it not for the good nature of the Colonel they would not be there that afternoon celebrating that happy event. 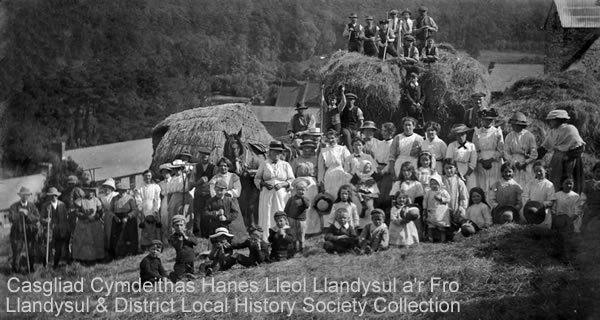 It was undoubtedly, a red-latter day in the history of Llandyssul, and he did not think there was a single town of similar size in the whole of the British Isles whose inhabitants enjoyed such a variety of privileges and amenities, as they did. Small country places very often suffered through lack of leaders – men of initiative; men of quality, and above all men of character and benevolence – men who were prepared to point the way and help along. But fortunately, they who lived in the beautiful Vale of Teify could pride themselves upon the fact that in Col. Fitzwilliams they had a man who possessed all those excellent attributes. Llandyssul people were deeply grateful to him for what he had done to make life more pleasant to live, and especially that afternoon for formally opening their memorial park. Mr. D.G. Williams, J.P., in seconding, thanked Col. Fitzwilliams for his generosity, and said he regarded the park as the most appropriate form of memorial. Having had it, the least they could now do was to keep it worthy of its object. It should serve as an object lesson to children to act kindly to one another, and he hoped that the older children would instruct future generations as to what war meant. In submitting the vote which was carried enthusiastically, the Chairman explained that it had been their firm intention to open the park in May, but owing to the illness and subsequent death of the Rev. T. A. Thomas, one of the most active members of the committee, they felt they could not move. Mr. Thomas also paid a tribute to Mr. Meirion Davies for his services in supervising the working operations. Tea followed, the children being served free. The day’s programme ended with sports, the officials being: Starters and handicappers, Messrs. Jack Hughes and Edgar Jones; judges, Messrs. D. Bowen Jones (Chairman of Sports Committee); Rhys Lewis, Jimmy Evans, Jim Jones, E. Lewis Jones, E. Lloyd Jones; announcers, Messrs. W.G. Thomas and J. Elwyn Thomas; stewards, Messrs. Idris Lloyd, Edward Lewis, Horace Davies, E.T. Morgan, D. Morgan Evans, Ieuan T.Hughes, M.A., J. Garfield Jones, A Trevor Rees; treasurer of sports fund, Mr. O.C. Harries. The following were the prize winners at the sports:- Race, girls under 10: 1. Mari Jones, Green Hill; 2. Irene Jones, Garfield; 3. Elsie Thomas, Penllwybyr. Race, boys under 10: 1. H Howells, Aberythan; 2. Dilwyn Davies, Barley Mow; 3. T.J. Davies, Blaenllyn. Race girls under 12: 1. Rena Davies, Barley Mow; 2. Glenys Davies, Abercerdin; 3. Margaret Davies, Charles-street. Race, boys under 12: 1. D.J. Phillips, Aberhoffnant; 2. Ifor Thomas, Wenfron; 3. Toni Gray Owen and Cyril Griffiths (equal). Race, girls under 16: 1. Esme Davies, Porth Hotel; 2. Muriel Davies, Tegfan; 3. Megan James, Dolbantau. Race boys under 16: 1. Cliff Williams, Starling; 2. Melfyn Davies, Abercerdin; 3. Bernie Jones, Cae, Henllan. Three-legged race for girls: 1. Margaret Davies and Olive Davies; 2. Glenys Davies and Rena Davies; 3. Olwen Head and Lizzie M. Davies. Three-legged race for boys: 1. W.J. Davies and Cyril Griffiths; 2. Cliff Williams and Willie Williams; 3. Lynn Davies and Elwyn Davies. Skipping race, girls under 12: 1. Olive Davies, School House; 2. Rena Davies, 3. Nansi Davies, Barley Mow. Skipping race, open: 1. Stuart Rees, Penrhiwllan; 2. Nellie Davies, Abercerdin, 3, Esme Davies, Porth Hotel. Tug-of-war, boys under 17: 1. County School team (capt. Gwyn Williams). Tug-of-war for adults: 1. D. Jones, Cloth Hall, and friends. Handicap race for girls: 1. Nellie Davies, Abercerdin; 2. Lizzie M. Davies, Mona House; 3. Ryan Rees, The Exchange. Handicap race for boys: 1. Islwyn Jones, Garfield House; 2. Harry Howells and Ieuan Jones (equal); 3. Leslie Davies. Open handicap race: 1. Freddy Thomas, Well Street; 2. Islwyn Jones, Garfield House; 3. Dai Evan, Abercerdin. High jump, girls: 1. Nellie Davies, 2. Esme Davies, Porth Hotel, and Beryl Davies, Arosfa, Tregroes (equal). High jump, boys: 1. Stuart Rees, Penrhiwllan; 2. Emlyn Davies, Crown Inn and Islwyn Jones (equal). 100 yards open handicap race: 1. Islwyn Jones; 2. Stuart Rees, Penrhiwllan; 3. Eilir Evans and Stinie Enoch (equal). Tug-of-war for boys: 1. Gwynfor Davies and friends. Sixty yards, under 8: 1. Devonald Griffiths; 2 Brynley Davies and John Jones; 3. Nance Davies.